. : Edward McCarthy :: Ski XCOttawa.ca :: Skiing in Ottawa and Gatineau Park :. Ed is pretty awesome. 22 years old, still living at home, still driving his parent's car, and just loving life. Who couldn't admire a simple, easily-pleased mind like that? Somehow he worked at the AECL Nuclear Laboratories in Chalk River this past summer, somehow he's about to complete a Mechanical Engineering degree at Carleton University this coming April - but we're pretty sure he's just faking it. Somehow. And somehow, he's consistently been near the top of his age class in Canada. 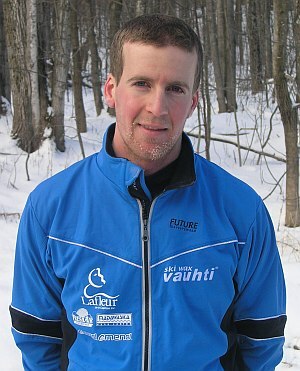 Best recent results include winning the Ontario senior men's championship in 2003-04, Carleton ski team MVP in 2005-06, and 10th place at Eastern Canadians at his home-course Nakkertok Ski Club. Doing all this WHILE keeping Mom and Dad happy at home? Wow. Ed will be focussing on the longer distance races this year - we wish him well. His parents would love to do the same.